On a cross-country bus trip in search of a minister to heal her scarred face, one woman discovers the true meaning of beauty, courage, and love. 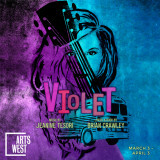 Winner of the Drama Critics’ Circle Award and Lucille Lortel Award for Best Musical when it premiered off-Broadway, and Tony Award nominated for its 2014 Broadway revival run, Violet features a score of show-stopping anthems ranging from American roots to folk to gospel from one of the most vibrant composers of modern musical theatre Jeanine Tesori (Caroline, or Change; Thoroughly Modern Millie; Shrek; Fun Home, winner of five 2015 Tony’s including Best Musical). Violet is presented in part by the generous support of: The Sheri and Les Biller Family Foundation. To capture director Andrew Russell’s exciting and experiential vision for the show, a portion of our audience is able to choose premium seating. These premium seats surround the stage, bringing the patron up-close-and-personal to the cast and offering unique perspectives that make for an unforgettable performance.